Ever wondered what a cross-section of a road drop bar would look like? Well, wonder no more! This was an interesting case of highway bike rack failure. I’ve seen a few such incidences where bikes were bounced or dragged down roads at speed, but this was certainly unique. Believe it or not, there was not a single mark or scratch on any other part of the bike, just the handlebar being ground to a razor sharp edge. The end of the drop and the bottom of the brake and shift levers are spears! 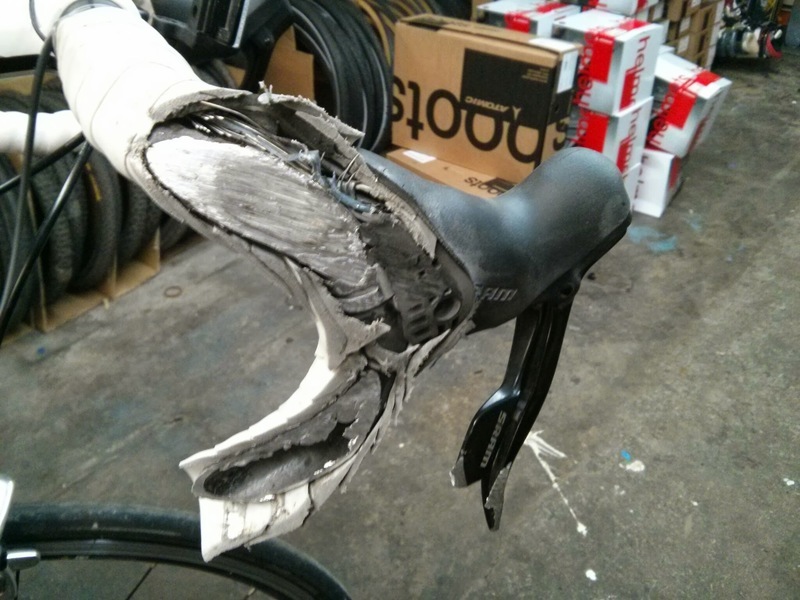 If I were this rider, I would feel really lucky because it could have been a much more expensive mishap for this mid priced carbon road bike. Only the bars and rear controls are going to cost any real money.